To help you decide which are the must-sees of Berlin we present a choice of the most interesting places with their history and practical information for visitors. You may print this page in PDF format to get a guide in paper form or, even better, get in contact with the local tour guide to book a private and personalized guided tour. The Reichstag was built between 1884 and 1894 by German architect Paul Wallot in Neo-Renaissance style. Today, the “Bundestag”, i.e. the parliament of the Federal Republic of Germany is housed here. The name of Reichstag recalls the times when Germany was still an empire (Reich) made up of several member states whose coats of arms can be seen at the Western entrance. During its construction it was heavily criticised, especially by Kaiser William II. himself who feared the dimensions of the building might surpass those of his palace. From 1895 until 1933, under the reign of the last German emperor and during the short-lived democracy of the Weimar Republic, the Reichstag served as seat of parliament. In early 1933, however, the assembly hall was damaged by a fire. Shortly afterwards, the Nazi came to power. At the end of WW II, the Reichstag became a battlefield and the red flag was hoisted there on April 30, 1945. Since 1999, the entirely refitted building, completed by the dome designed by Sir Norman Foster, is once more the official seat of the German Parliament. It is visited by more than 3 million people every year. After some years of uncertainty about what would be the adequate monument to represent “the unity and the workforce of the people of the GDR” and the site where it should be constructed, the East Berlin authorities finally decided to erect this tower in the very centre of the city, as a symbol of progress and success of the socialist system. With a height of 368 m it is one if the tallest structures in Europe. Since 1969, when it was opened, it has been visited by more than 43 million people wanting to admire the impressive view of both East and West Berlin from 203 m above the ground. There is a restaurant in the sphere which slowly revolves on its axis, a full turn taking 30 minutes. The tower is open to visitors from March to October, 9 am - midnight. From November to February, 10 am - midnight. Admission: € 10.50 / 6.50 concessions (under age 16). It is the last existing gate of a wall that surrounded Berlin until 1860 serving various purposes: soldiers were prevented from desertion, citizens were controlled and taxes charged. The square in front of the gate, Pariser Platz, was designed in 1730, the gate itself dates from 1789. 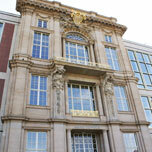 It is the first example of Neo-Classical style in Berlin, based on the Propylaea gateway of the Athens Acropolis. 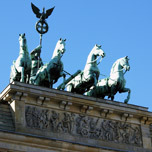 Originally, the Quadriga statue and the bas-reliefs, depicting figures from Greek mythology, were meant as symbols of peace, following victory. Reality took on a different course and since French troops entered Berlin in 1806 it became more associated to war and nationalism. The Gate’s history as a “triumphal arch” culminated in the parades of the Nazis and the entire destruction of its surroundings during and after WWII. Later, the Brandenburg Gate was a symbol for the division of Germany, with the Wall running behind it since 1961. 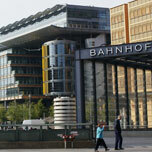 Today, it is wonderfully refurbished, standing for the rebirth of the city after German reunification. There is a reconstructed “guard room” at each side of the gate: In the Northern one, visitors are asked to keep silence - it is a public meditation space open to all religions. The tourist information office is in the Southern guard house. 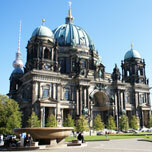 The city’s oldest sacred building is located in the very heart of what used to be “ancient Berlin”. The quarter was reconstructed on the occasion of the 750 years anniversary celebrated in 1987. The base part of the church, made from fieldstones, dates from around 1230 and is the only example of late Romanesque style in Berlin. Another ancient feature is the Gothic choir dating back to 1380. Around 1480 the church was redesigned and made into a brick hall-church. During the Renaissance and the Baroque period further structures were added or altered. The top of the double spire is a Neo-Gothic feature added in 1876. The church, that had been severely damaged in the air raids of WWII, was rebuilt between 1981 and 1987. Today, Nikolaikirche is affiliated to the Märkisches Museum (the city museum) and houses an exhibition about Berlin. Open Tuesday to Sunday, 10 am - 6 pm. Wednesday, 12 am - 8 pm. Admission free (donations welcome). 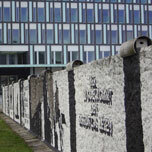 The Berlin Wall – Berlin’s main attraction? The Wall is still closely linked with the image of this city where a lot of 20th century history was written: Actually, nobody wants to leave Berlin without having seen what remains of it, trying to understand why and how it came to be built in the first place. 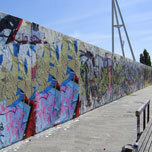 East Side Gallery, the longest surviving section of the Wall transformed into an open air gallery (U and S-station “Warschauer Straße”). Bernauer Straße, with its documentation centre and watchtower, the former “wall strip”, rests of the Wall and the Wall Memorial (S-station Nordbahnhof). As we want to introduce you to Berlin’s most beautiful monuments, we must not forget one person who decisively marked the architectural development of the city. Karl-Friedrich Schinkel (1781-1841) is by far the best-known German architect, even outside his home-country. He did not only create new styles, but set up a whole movement in the first decades of the 19th century, a period even referred to in German as Schinkelzeit. 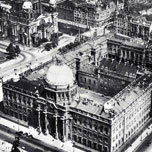 His masterpieces in Berlin are the Theatre (today concert hall) on Gendarmenmarkt, the Old Museum, the Friedrichswerder Church (see picture) and the Neue Wache (Royal Guardhouse). Schinkel was a man of many talents: Among his works are also oil paintings representing romantic landscapes and sky-scratching cathedrals, to be seen in the Old National Gallery, as well as interior designs and stage sets for the opera Unter den Linden (one he did for Mozart’s “Magical Flute” is actually still in use). The Friedrichswerdersche Church houses a permanent exhibition about Schinkel and 19th century sculpture. Open daily from 10 am to 6 pm (free admission). The Zeughaus, the former armoury, was the first building on the avenue Unter den Linden and is still one of its main showpieces. It was built between 1696 and 1705, under the reign of the Elector Frederick III who crowned himself king Frederick I “in Prussia”. Various architects contributed to this beautiful Baroque structure: Arnold Nehring, Martin Grünberg, the Huguenot Jean de Bodt and Andreas Schlüter. The rich sculptural ornaments show empty helmets on the outer façade and the famous masks of dying warriors (work of Schlüter) on the inner façades around the central courtyard. The pediment is dedicated to Frederick I. Today, the Arsenal, together with an extension built by the Chinese-American architect Ieoh Ming Pei, is home to the German History Museum. Admission 6 €, free until age 18. The ruin of the Memorial Church is one of the best-known landmarks of Berlin, keeping alive the memory of the devastating consequences of WW II. Originally, it was built in commemoration of the first Kaiser, Wilhelm I, and his victory at Sedan over Napoleon III. The church lies on famous “Ku’damm”, main shopping mile in the Western part of Berlin and, until 1989, the show-case of capitalism in the divided city. The street itself became a 53 m wide boulevard in the 1880s when Chancellor Bismarck had the idea of giving Charlottenburg a Paris-like touch, which also accounts for the huge Neo-Romanesque cathedral constructed by Franz Schwechten from 1890 to 1895. What remains of the church is the ruined spire called affectionately “Hollow Tooth” by Berliners. In the rump of the church, now there is a memorial hall. The only surviving original decoration is a splendid mosaic frieze relating glorious deeds of the House of Hohenzollern who ruled in Berlin for almost 500 years. After long discussions in the 1950s, finally the decision was taken to maintain the ruin and incorporate it in a project of modern architecture. 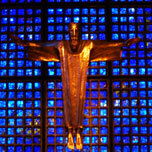 In 1961, Egon Eiermann built a new church, with a nave of octagonal shape and a separate hexagonal tower of 53 m height. When the Thirty Years’ War was over, the land of Brandenburg as well as Berlin were ravaged and deserted. The Great Elector and, from 1688, Frederick III did their best to reinforce their country’s political and military position. In order to build up its economy a productive people was needed. For that reason the Electors facilitated immigration, inviting protestant refugees from all over Europe to come to Brandenburg. Also Jewish families, who had been driven out of Vienna, were allowed to settle. The biggest group of immigrants were the Huguenots: French Calvinists forced to leave their home country when Louis XIV revoked the Edict of Nantes which had granted them religious freedom. Besides their faith and their language they brought with them an outstanding technical know-how that contributed considerably to the flourishing of the Electors’ residence. In the early 18th century, under the reign of Frederick I who had just become king, new quarters had to be build outside the fortification walls. One of them was Friedrichstadt, located around this rectangular market square which preserves its name from the time when a soldiers regiment called Gens d’Armes had their stables there. On one side of Gendarmenmarkt, the German parish had their church built, the Deutscher Dom; on the other side the French built theirs, called Französischer Dom today. The centre between the two churches is dominated by the Neo-Classical theatre constructed by Schinkel. The new quarters of town, planned and built in the Baroque era as described above, became home to wealthy families and immigrants favoured by special laws. The poorer people settled outside the walls in sometimes slum-like suburbs like Spandauer Vorstadt. What is nowadays one of the most popular quarters of Berlin used to be the home to workers and petty bourgeoisie where poverty and crime were a common sight until well-advanced the 20th century. In 1904, a proprietor had the idea of creating a complex of apartments, offices and cultural institutions within a structure of an entire block. The buildings were connected by several courtyards, the first of which was splendidly decorated with tiles in Art Nouveau style by the architect Alfred Endell. Shortly after the wall had come down, this jewel was rediscovered and completely refurbished, reviving the original mix of living and working, entertainment and restaurants. More courtyards are to be found in the surrounding streets, each with its own charm and style. In this area, there are also several historic Jewish sites as well as present-day Jewish institutions. In the first years after WW II, in a joint effort numerous plans for Berlin's reconstruction were made and discussed, with famous architects like Le Corbusier taking part in the planning. But, as we all know, the growing tensions between Russians and Western Allies finally led to the founding of two German states thus putting an end to town-planning on an all-Berlin scale. The different visions became manifest shortly afterwards, when the GDR put forth its first big construction project in 1951, a monumental boulevard then called Stalinallee in honour of the Soviet dictator. 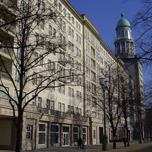 In several phases and decades, huge structures of apartment blocks altering with social and cultural institutions were erected along a wide axis leading towards Alexanderplatz. The older section definitely reminds of Moscow’s ostentatious Neo-Classical architecture of the Stalin era. There are some fine details to be discovered on the buildings and the ensemble is really impressing. William II, always eager to compete with his British relatives, wanted a more magnificent Protestant cathedral worthy of an imperial capital, just opposite his palace. So the former one, built in 1822 by Schinkel, was demolished and the pompous “Dom” took its place - an impressive fusion of religion and worldly power. The structure, designed by Julius Raschdorff in Eclecticist style and erected from 1894 to 1905, comprised a central nave and two chapels, one for weddings and christenings on the South side and a funeral chapel to the North that was not reconstructed after its destruction in WW II. Meanwhilie, no trace is left of he Hohenzollern palace, but the church is was reconstructed in socialist times, although the funds came from the Protestant Church in Western Germany, as the building was considered a common heritage. Monday to Saturday, 9 am - 8 pm (7 pm*), Sunday, 12 am - 8 pm (7 pm*). The dome (270 steps) is open from 9 am to 8 pm (5 pm*) – Admission 5 €. * From October to March – last admission 1 hour before closure. This place has gone through very different phases: Until 1939, it was Berlin’s central traffic hub and a centre of economic life. After most of its buildings had been destroyed in the war, it became no man’s land between the sectors, by the wall (principal and secondary). After Berlin had been reunited, it regained importance once again. On this historic site, an entirely new quarter of very modern buildings was created. Besides a popular shopping mall, there is a big offer of entertainment like cinemas and musical. 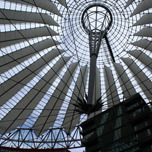 The Sony Center is an impressing example of future-oriented design housing the headquarters of Sony Europe and Deutsche Bahn (German railway) as well as a Film Museum. Learn more about Berlin’s most recent architecture on a guided tour of Potsdamer Platz and the embassies quarter! 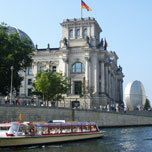 Most of the historic monuments of Prussian history lie in the city centre which formerly belonged to East Berlin. The palace of Charlottenburg is the finest exception. It may seem difficult to imagine that the city of Berlin did not reach yonder the Brandenburg Gate until the beginning of the 20th century. Charlottenburg was an independent and wealthy town, owing its origin to the construction of a summer residence for the elector Frederick III around the year 1700. After he had become king (Frederick I) the structure was amplified and, in 1705, it was given the name of his late wife Sophie-Charlotte. The ensemble was extended under his successors, Frederick the Great (II) in particular. It was seriously damaged by bombings in 1943 and almost pulled down after the end of the war. Luckily, reconstruction was agreed and nowadays we can tell it was worthwhile. You should take your time for a visit of the palace and the gardens, kept partly in French Baroque, partly in English style. Have a look at the chambers of Frederick I and Queen Sophie Charlotte and the Knobelsdorff wing where Frederick II used to lodge. 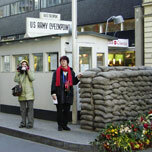 Checkpoint Charlie is a relict of the divided city and the times of the Wall. Here, at one of the few passes of the inner-city border, American and the Russian tanks stood aligned facing each other in October 1961. The border checkpoint has disappeared, but there is museum to keep alive the memory of the people who tried to leave Eastern Germany after the Wall had been drawn up, those who succeeded and the ones who lost their lives in the intent. The exhibition shows all kind of objects from Cold War times and illustrates the many inventive ways how people managed to escape. Another part of the museum is dedicated to pacifism and the fundamental rights. The towns of Berlin and Cölln, founded in early 13th century, lay on the northern river bank, around St. Nicholas Church, and on an island in the river Spree. Later the Hohenzollern electors built their residence on the island (destroyed in 1950 by the GDR authorities). In the proximities, representative buildings of the army (armoury) and the church (cathedral) were located. But in the 19th century, when the structures of society were changing, it occurred to the monarchs they should give their people opportunity to study the wonders of culture and nature. A museum was planned – as a present to the citizens. 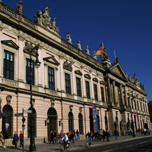 The first museum on the Museums Island was the Old Museum, built in 1830 by Schinkel. Soon afterwards, the New Museum by Friedrich August Stüler was designed to house more of the great treasures, especially the collection of Egyptian antiqzes. 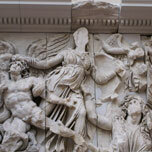 In 1876, the National Gallery opened its gates, dedicated above all to German 19th century painting and sculpture. On the head of the island, the Bode Museum, named after its first curator, shows a miscellaneous sculpture exhibition and one of the biggest numismatic collections in Europe. It will reopen in October 2006. The last one in this ensemble of five museums was the Pergamon Museum, constructed between 1910 and 1930, probably the most famous one because of its spectacular exhibits: e.g. 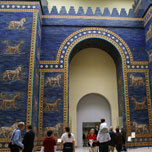 the Pergamon Altar and the Ishtar Gate from Babylon. 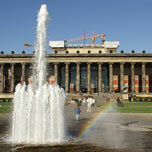 The history of the Museum Island entered a new phase when it was declared World Heritage Site by UNESCO in 1999. 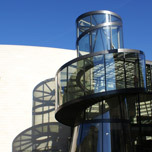 According to a so-called Masterplan 2012, a new entrance building and an archaeological gallery connecting several museums will be added to the complex. The exhibition suface will be enhanced by including the ground floors, formerly used as storage depots. The New Museum that had not been rebuilt since the war is to reopen in 2009, after 60 years. 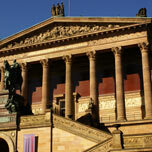 On our cultural pages you find additional information about current exhibitions on the Museum Island. The Palace of the Republic was built on the site of the old royal palace of Berlin. The palace had been damaged in WW II and was torn down in 1950, although a reconstruction would have been possible. It was a political decision to demolish the symbol of Prussian monarchy, as the GDR was craving for a different image. Still, it was not replaced by a building for the “people” until over 20 years later. The Palace consisted of three zones: The assembly hall, where the National Assembly met once a year, a multi-functional hall with 5,000 seats and the lobby with 13 restaurants – an immensely popular place in GDR times. The original palace was first founded as a residence castle in 1443, shortly after the House of Hohenzollern had gained sovereignty over Brandenburg. Later it was amplified, converted into a Baroque Palace. In the 19th century, it had reached a dimension of 192 m in length and comprised 1,210 rooms – evidently the most imposing structure of the city. As almost all famous architects of Prussian history had contributed to the palace, it combined a mixture of architectural styles. Following a decision of the German parliament, the Palace of the Republic is presently being demolished. The demolition works have started in January, 2006. As for now, it is not sure if and when the Hohenzollern Palace will be remodelled. In the meantime, the site will be converted in a green space. The website of the Foundation for the reconstruction of the Royal Palace. Berlin always remained German capita, although Bonn had been goverment seat of the Federal Republic of Germany since it was founded in 1949. s founding. Only in 1991, the German parliament decided that the goverment institutions should move from Bonn to Berlin - with a slim majority. This conclusion involved a huge public investment and thorough planning, as numerous new administrative and parliamentary buiildings had to be created. Several major construction projects were put into reality in the nineties. On the other hand, a lot of old building were renovated or even rebuilt in order to adapt them to the requirements of a new use. Today, over 20,000 people work in the facilities of the new government district. But also visitors should take the opportunity to get an insight into the surroundings of German parliamentary life and visit the Band of Federal Buildings, composed by the Fereal Chancellery, the Paul-Löbe and the Marie-Elisabeth-Lüders building and, off course the Reichstag building. 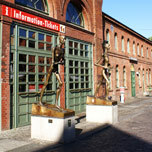 The “Cultural Brewery", a huge brick complex with neo-Romanesqe details, is the heart of this area. Founded in 1842, the brewery during many decades bore the name of “Schultheiss”, gaining the European export leadership in early 20 th century. The refurbishment of the early industrial structure was carried out with great care and respect, thus conserving the authentic charm of the site. Today it houses numerous cultural institutions (cinemas, theatres, concert halls) as well as a “beer garden”, bars and clubs, like the Frannz Club that took up a tradition dating from GDR times.. The New Guardhouse is probably one of the finest arquitectural designs by the famous Berlin architect Karl Friedrich Schinkel. 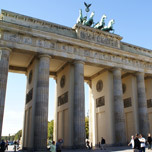 It was built in 1818, in commemoration of Naploleon's defeat and the liberation of Berlin. Later it became memorial of other warsand was completely redesigned in 1931. In GDR-times it was transformed into a memorial for the the victims of fashism and militarism and also the changing of the guards took place here. Today it is the Federal Republic of Germany's "Central Memorial for the Victims of War and Tyranny". 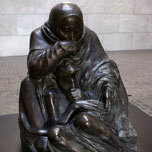 Inside the almost empty room is an enlarged replica of a sculpture: "Mother and Dead Son" by Käthe Kollwitz, a famous German artist who lost a 19-year-old son in WW I. This column or tower called “Siegessäule” in German, work of the architect Heinrich Strack, was built between 1865 and 1873, in order to commemorate the triumph of Prussia’s military success in the wars against Denmark in 1864 and Austria in 1866. When it was almost finished, another bas-relief was added on occasion of the victory over France in 1871. The statue on top representing the victory goddess was created by Friedrich Drake. Originally, it was erected on the square in front of the Reichstag and only moved in 1938 when Hitler’s architect Albert Speer took the first steps of what should have been Berlin’s transformation into a mega-capital called “Germania”. One of the buildings of his project, the “big hall of the people”, was planned to be 320 m tall (compare: Victory Column 53m). On its new location in the centre of the Tiergarten the column was completed by four Neo-Classical temples and additional cylinder on its base. The cannons of its outside decoration are real ones taken from the Napoleons troops during the Liberation Wars. In 1945, some bas-reliefs were removed from the plinth by the French, but returned to Berlin for the 750-years-anniversary celebrated in 1987. The column is closed due to transformation from February 2010 to June 2011. 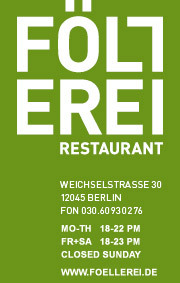 ((( Open: April to October 9.30 am to 6.30 pm, Saturday/Sunday 9.30 am to 7 pm.